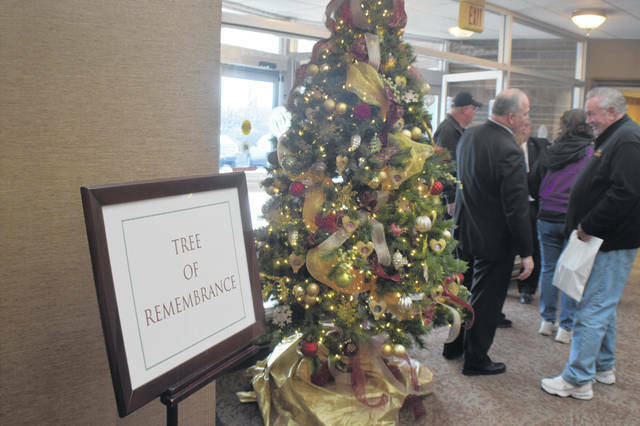 The Tree of Remembrance sits in the lobby of Chiles-Laman Funeral & Cremation Services, Shawnee Chapel. 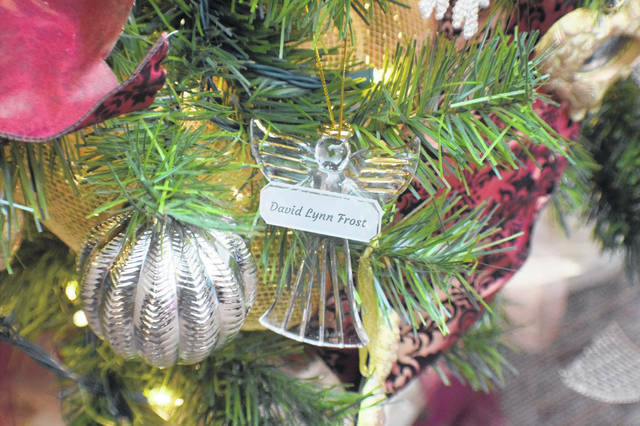 Angel ornaments were given out to be placed on the Tree of Remembrance or taken home. LIMA — Jim Chiles, past president at Chiles-Laman Funeral and Cremation Services, has been to every Tree of Remembrance Service. On Saturday, Chiles reflected on the beginnings of the services, which are designed to help those who have lost loved ones during the year. “I learned about it from a funeral director friend of mine out in California who did something like this, but he did it in the cemetery which he had, and of course, his weather was always nice. We did it and we said we didn’t care whether we had 25 people or 75 people. Well, we had a little over 100 people the first time, and now it runs between 300 and 400 people that come out,” he said. The services help provide closure to hurting families. “I had a lady ask me one time, ‘How long are you going to do this?’ and I really had never thought of that, and I just simply responded, ‘I guess until people tell us they don’t need it any longer,’ and so it continues,” said Chiles. The Tree of Remembrance Service is now in its 28th year. More than 300 people turned out Saturday at the funeral home’s Shawnee chapel to reflect on the passage of their loved ones. Rev. Todd Cosart from Southside Christian Church and Rev. Jim Szobonya from St. Gerard Catholic Church led the service. Members of the Lima Symphony Youth Orchestra performed along with soloist Deanna Cira and pianist Mary Jane Eichelberger. “Every family that’s lost a loved one in the past year, we invite to this service, hopefully, to help them get through the holiday season, which is always difficult for when you’ve lost a loved one,” said Bob Laman, current president of Chiles-Laman Funeral and Cremation Services. The Tree of Remembrance itself is in the lobby of the chapel. Symbolic ornaments can be placed on the tree to remember the life of a loved one. “[For] the ornaments this year, we’re doing an angel. We put the person’s name on the ornament, and it’s a keepsake for the family for years to come. Those that would like to put it on the tree are more than welcome to. Many family members will take them home and put them on their own trees then,” said Laman. The Tree of Remembrance will remain lit until New Year’s Day in honor of the memory of deceased loved ones.